It’s such an interesting message the world sends us this time of year, and by interesting, I mean flat-out ridiculous. Get your shopping done, wrap those gifts, mail those Christmas cards and photos (the ones you took back in August), bake those cookies, host those parties, assemble the gingerbread houses, deck the halls. And that’s just the first week of December. I might have dropped dead on my floor yesterday morning when I saw how a friend on Instagram was already done with her Christmas preparations. FINISHED. Didn’t help that our Thanksgiving leftovers were still sitting out on the counter, next to the rotted Halloween pumpkin, when I came upon her post. And she planned it this way so that she could actually enjoy the month of December. Which I suppose, is a brilliant idea, if you have that kind of motivation. I, however, am the kind of woman who still has a stack of half-written and never sent Christmas cards from last year, stuffed into my china cabinet drawer. If you’re lucky, maybe I will send you one…in time for Easter. And you know, every year I say the same thing. “I am not going to miss it.” The purpose. The meaning. The reason. The incredible build up of the immense weight of glory that is about to be born. I insist that this is the year Christmas will not be reduced to the to-do list the world writes for me, but rather, it will be a period of intentional waiting, an Advent season where my gaze is truly fixated on the empty manger, pregnant in the anticipation of being filled with the complete and awesome wonder of a newborn King; a King I so desperately need to come, to be born, and to rescue me, again and again. And then suddenly there I am, tearing at rolls of gift wrap with my teeth like a great white shark, and cursing out the stupid scotch tape dispenser like a full-on crazy woman, ordering my poor husband to go back out to Petco on Christmas Eve to purchase the third guinea pig that week, because the first two I brought home were not longhaired enough, and insisting that he must go back to Costco for more cheese and a larger ham, because I mean really, what on earth was he thinking buying so little cheese and such a small ham? It’s CHRISTMAS people…you get the mother lode of cheese and you bring home the giant freaking ham!!!!! Because that is exactly what Mary did the night before she gave birth to the Son of God. She scrambled like a lunatic for last minute gifts and sent Joseph to Costco, because the birth of her Son just wasn’t enough. And this pierces my heart as I write it…that the newborn baby Jesus…He just isn’t enough. And sure, maybe we don’t really mean that, but I think that maybe, we can surely act like that. When we stress over perfect menus and the matching kids clothes, and spend more time worrying about will we have enough money to grant everyone’s wishes, and will we be able to provide a good Christmas for our friends and family…well…I think when we do this, it is as if we are saying that baby Jesus, being born and with us, is not enough. And I don’t believe we do this intentionally. I do not believe we push Him aside, promising to get right back to Him, just as soon we complete all of our preparations, on purpose. I think it just happens. I think we so easily get caught up in the race, and dragged into the malls, and busy with the online shopping that is all too easy, and before you know it, we are getting pulled into Petco (OK, so maybe that last one is just me) because we actually have really good intentions. We want the kids to be happy on Christmas morning. We want our holiday guests to feel at home. We want our feast to be delicious. We want to eat our body weight in cheese. We want to do all of these things because we want to have a beautiful Christmas. We are all about the baby Jesus, it is just that sometimes? Sometimes we just go about it the wrong way. Sometimes we get pulled in the wrong direction. I know I do. And when I do? I miss it. There is a balance in all of this, isn’t there, and for those of you who have mastered it, please share. Because it is not easy to do and I think no matter how many of us try, we often fail. I do believe that we can have the baking, and we can have the gifts, and we can do all of our traditionally fun and expected things, if in fact…they are still fun and not just something we feel we ought to do because that one perfect lady we follow on social media does is, and look at how happy her family looks! But, how can you tell? How do you know what should stay, and what ought to go, this Advent? Well, before hitting your Christmas to-do list, might I suggest, you pray over it. Seriously. Take that list to prayer. Ask God what He would like to see you do for Him this Advent season. Because my guess is that God’s way of preparing might look slightly different from the world’s way of preparing. So it is wise to check in with Him, and ask….will doing this bring me closer to Your Son? Will this task, next on my list, deepen my love for You? How can I offer up this activity as praise and glory to You? Will this third guinea pig fill our home with the true joy of the birth of Jesus Christ? And the answer to that last one is a resounding NO. The three guinea pigs have only brought true smell to my daughter’s bedroom. Zero Jesus. If you are considering that Santa bring a live pet this year, come on over to my house first, and smell my upstairs. You know, when I really meditate on the nativity, when I truly take some quiet time alone, escaping the chaos and the anxiety that without fail, washes over me this time of year, I can not help but find my tired mind taking me back to that one Christmas, five years ago; that one Christmas, that followed after the shooting at my children’s elementary school. That one Christmas, where my community felt the groaning labor pains of the birth of unspeakable and devastating loss. That one Christmas, where we suffered such sorrow and disbelief, and couldn’t imagine, for the life of us, how Christmas would come. Should Christmas come? And the miracle? Not only did Christmas come, but it came powerfully. It came beautifully. It came just as it promised. Because when you are reminded with what this life is all about, and you are slapped in the face of the reality that we need God like never before, guess what happens to that to-do list? Guess how much you care about the cookies and the parties and the wrapping? Everything takes on new meaning. Suddenly, you long for real presence, not presents. That Advent was like no other Advent I have ever lived through before. It was truly what Advent is supposed to be. A holy waiting period. A sacred preparation. A stripping away, a pulling apart, and a re-focusing. An awakening to the undeniable truth that the only thing we need, the very best gift we can ever hope for, is that swaddled baby boy, that newborn King. His presence is the only present. And until that sorrowful Christmas, I never knew how badly I wanted, how crazy much I needed, that gift. That baby. And that is what the Advent season needs to be about. And I know it is hard. It took my being stripped away of everything, in the most hideous way, to see where I actually needed to be. 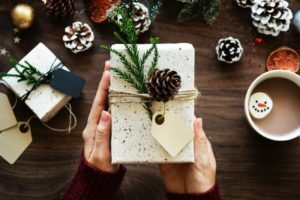 It took giving up on my idea of what our Christmas was supposed to look like, and surrendering to God and His idea of what Christmas needed to be. It took my handing over my list…LITERALLY….and allowing friends to swoop on in and do what I was too sad to do. And guess what? Christmas still came that year. Sure, it looked different. It carried a weight of sorrow. But if you were to kneel next to Mary right now…right there in the stable…get on up close next to her, with the hay and the animals and the smell of the stable…and if you were to reach out and pick up that sweet babe, swaddled up tight, and gently kiss his head, and press His heart close into yours….would you not feel a tinge of sorrow? Yes, the birth of our savior is a joyful occasion, but because we know His mission, because we know His sacrifice, because we know that the same baby we reach for in the manger is the same man who we hung on the wood of the cross, how can we not weep? And so maybe this Advent season, if you feel that earthly pull, if you feel that building anxiety and the stress of the world’s to-do list, maybe it is a good idea to just stop. To be still. To give your list over to the Lord. And then, go on into the stable. Kneel down next to Mary. Close your eyes. And in joyful expectation, wait with her by the empty manger. Just wait. He will soon be born, sweet friends. The hope we wait for. The grace we need. The Christmas presence that is beyond compare to any other present on our list. And He is more than enough. So let’s prepare wisely. Let’s not miss it.